Distribution & Habitat: Anthurium andreanum is a spectacular South American perennial epiphytic plant, which produces dark green, glossy leaves about 23cm (9inch) long. There Anthurium andreanum is a nearly continuous show of bright red spathes with yellow spadices. This plant is originally from wet tropical mountain forests of Central and South America will it does best in warm, wet climates. Description: Anthurium andreanum is a most spectacular indoor plant with large heart-shaped leaves and striking flowers spathes in shades of bright red colour. 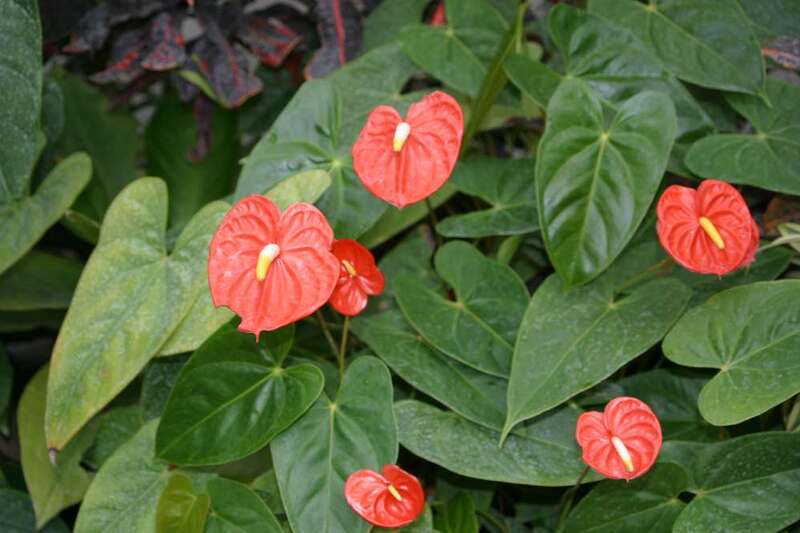 Proper Care: In cooler areas Anthurium andreanum must be grown in warm, well lit position indoors, but in tropical areas they are suitable for verandahs and sheltered positions outdoors. Keep moist in growing season and drier in winter. Applications of slow release fertiliser or liquid plant food are beneficial. Keep this plant in a handsome ceramic pot that coordinates well with the colour of the booms. Snip out central flower to prolong the life of the colorful spathes and to avoid pollen on tabletops. Light: Because of their sheltered position in their native rain forest, too much light or direct sunlight can harm Anthurium andreanum. In fact, Anthurium andreanum can survive in areas of the home that receive very little sun, but it will flourish when placed near windows where it receives filtered sun. When it comes time to blossom, Anthurium andreanum need the proper amount of sunlight in order to bud. Water: Keep the potting soil moist at all times, but need to dry out a little between sessions. To match Anthurium andreanum natural habitat, they should be watered more frequently in the summer and less frequently in the winter. Mist aerial roots (roots that are above the ground) frequently. Anthurium andreanum will perish when excess watered or when the soil or container does not drain well. The foliage and roots of the Anthurium andreanum still need to be kept slightly damp, mirroring the natural humidity of their growing habitat. In order to maintain the humidity around them, plants can be sprayed slightly with a spray bottle or can be placed a tray of damp pebbles beneath the plant. Temperature: Because of the warmth they receive in the rain forest, Anthurium andreanum need to be kept in an area that stays between 15 to 30oC (60-85 oF). Fertilising: Anthurium andreanum do not need much fertilisation, but to get them to produce beautiful flowers, it’s best to give them some nutrients. They should always be fed slow-release fertiliser that is specially formulated for blossoming plants. Newer plants don’t need to be fertilised for several months, since they will have been well-fed at the nursery where they were raised. On older plants, however, fertilise about once a month, using only about 20 to 25 percent of the amount recommended on the packaging. Additionally, Anthurium andreanum flourish when treated with occasional doses of magnesium, which can be applied by adding a half tea spoon of Epsom salts to water when watering. Treat Anthurium andreanum with magnesium about once a month. Potting and repotting: Anthurium andreanum do better when planted in pure sphagnum moss or a mixture that is three parts peat, one part gravel and one part chopped sphagnum moss. The coarseness of the gravel and the sphagnum moss can be altered depending on the age of the plant – as a young plant, Anthurium andreanum needs more water retention than the course mixture provides, but as it gets older it needs better draining soil. Do not replant again until the container is filled with roots. Propagation: To propagate the Anthurium andreanum, divide or take cuttings of stems with two nodes or more. Put cuttings in water and about a month later, plant the Anthurium andreanum cuttings in containers. Keep them out of direct sunlight while they are in water. Also, new containers can be created by dividing up the bulbs from older containers into separate plants. This should only be done in the springtime. Although Anthurium andreanum can be started from seeds, it may take newer plants up to three years to reach maturity and begin blossoming. Uses: Fix the plant to a piece of dead branch, surround the roots with sphagnum moss and tie everything together with nylon fishing line, then hang from the ceiling. Grow in a warm, humid greenhouse or conservatory, mimicking the conditions in a rainforest. Don’t let the moss dry out, and don’t let the temperature drop below 16oC. Anthurium andreanum are a popular addition to floral arrangements for their exotic forms. A single specimen in a simple bud vase can last as long as three weeks, sometimes causing it to be mistaken for plastic. Anthurium andreanum can make spectacular houseplants, as long as they are not exposed to direct sunlight and their soil is kept constantly moist. As true tropicals, anthuriums can be grown reliably outdoors in Hardiness Zones 11 to 12. Anthurium andreanum is one of the plants listed in the NASA Clean Air Study as effective in removing formaldehyde, xylene, toluene, and ammonia from the air. Toxicity Anthurium andreanum contain a high toxicity level, and all parts of the plant are hazardous when eaten. Thus, pets should be kept well away from the plant. Additionally, the sap of the plant causes an occasional allergic reaction, so take care when handling the plant. Excess light: Leaves appear bleached in the centers and may have brown tips. Overfertilization: Lower leaves become yellow and develop brown tips that gradually enlarge. Treatment: Reduce fertilization and leach soils thoroughly. Check roots for damage and possibility of secondary infection by fungus or bacteria. Treatment: Check pot’s drainage holes to make sure they are not plugged by debris. Do not allow this plant to stand in water. Water less and consider repotting the plant. This plants need a little air around their roots. Lack of flowering: Mature plants produce many leaves but few flowers. No flowers on the lateral shoots. Treatment: Increase light level. Maintain higher light intensity as long as leaves do not develop symptoms mentioned in excess of light. Bacterial problems: Bacterial symptoms on Anthurium andreanum occur on all parts of the plant but usually start on the leaf margins where the bacterium enters through hydathodes. Lesions are first translucent, yellowish and water-soaked. They may take a long time to enlarge but eventually they can encompass the entire leaf margin, invade the center of the leaf and even cause leaf abscission. Mature lesions are black and usually surrounded by a bright yellow halo. If the Anthurium andreanum becomes systemically infected, the plant will show signs of yellowing, stunting and loss of lower leaves. Eventually systemically infected plants die. Fungal problems – leaf spot, flower blight, and root rot: leaf spot and flower blight are characterized by small water-soaked lesions on the leaves and/or spathe tissues. These lesions turn black and remain wet appearing as they enlarge. They can encompass the entire flower or leaf under conditions of both high temperature and moisture which are favorable to pathogen development. When conditions become drier or cooler lesions dry and can appear papery but usually remain quite dark in color. Root rot shows the following symptoms: leaves wilt, may turn yellow or pale green and eventually die. When plants roots are examined they reveals their rotted condition. Initial infections of the roots appear as small water-soaked grayish or brown lesions. These lesions can rapidly expand to affect the entire root system. Severely infected plants may have no living roots remaining by the time they are examined. Treatment: Prevention is always the best control of a soil-borne pathogen. Use clean pots, potting media, and grow plants on raised benches. Since Anthurium andreanum is rarely tolerant of heavy or poorly draining potting media, the appropriate mix is critical. Pests: Though pests are not a problem in Anthurium andreanum cultivation, insects like aphids, scales, thrips and spider mites are found to attack the plants and cause considerable damage. Treatment: The best method of insect control is to monitor the plants and treat them before they get out of hand. Insecticidal soaps work well on the soft insects, but scales may need a stronger insecticide. One of the best ways to stay clear of the use of chemicals is periodic wiping of the foliage and a gentle spray of water. Make sure not to forget the undersides. Plant does not bloom: This problem can appear when the plant is too young or the plant has too little light or too much nitrogen fertiliser. Treatment: Plants do not bloom until they are about 1 year old. To promote bud formation, move the plant to a bright place, such as filtered light from a south or west window. After buds open, move plant to lower light. Check fertiliser analysis to make sure the second number (phosphorous) is higer than the fist one (nitrogen). Longevity: Anthurium andreanum will be a healthy plant for 5 years or more, but when it is propagated by division it can last indefinitely. SUMMARY: Anthurium andreanum are relatively easy to grow with attractive foliage that can produce long lasting flowers year round. With a little care and attention, enjoy a touch of the tropics all year round in home with a beautiful blooming Anthurium andreanum plant.